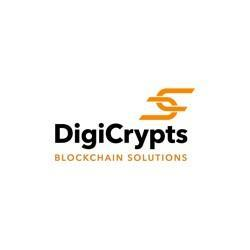 Toronto, Ontario--(Newsfile Corp. - April 3, 2019) - DigiCrypts Blockchain Solutions Inc., (CSE: DIGI) now doing business as DIGIMAX GLOBAL SOLUTIONS (the "Company" or "DigiMax") is pleased to announce the appointment of 4 experienced individuals who will comprise Phase 1 of the DigiMax Investment Banking Team. As described in more detail below, each of these individuals has experience in banking related fields with a combination of large global banks, and smaller institutions, that are directly related to the DigiMax operation. These individuals have diverse backgrounds and business experience, resulting in DigiMax having a wide array of skills to draw from to assist clients that vary by industry, global geography, and size. During the balance of 2019, DigiMax intends to grow the team from its current Phase 1 composition of 4 experienced individuals to Phase 2 that will include 10 people. introducing these clients to registered lead broker dealers, registered selling brokers and exchanges where the securities issued may be traded in a secondary market. The client would contract directly with the registered service providers for such services. The actual offering and sale of such securities will only be completed through registered broker dealers in the jurisdictions where required. Upon DigiMax obtaining a broker dealer registration (or similar) in certain jurisdictions (including becoming an Exempt Market Dealer in Ontario, Canada if approved), DigiMax will offer such services where allowed through such registrations. Mr. Stone is a business growth specialist and an entrepreneurial trader with 20 years of cumulative experience investing and trading in, equity, foreign exchange, commodity and crypto-asset markets. He has demonstrated a track record in proprietary trading while growing client business as a market maker. He is a strategic investor with a passion for high-volume trading and a solid understanding of global markets as well as being skilled in developing and executing highly effective investment strategies. Mr. Stone is highly adept in providing expert analysis of market conditions by gathering key data, analyzing trends, generating forecasts and offering comprehensive evaluations to meet client objectives. He has developed an expertise in mining, oil, TMT, banking and retail sectors. Mr. Stone spent 14 years with Merrill Lynch/ Bank of America in London, England in increasingly senior roles across a wide variety of industry specialties. During that period he recorded many significant achievements including growing book inventory from $10m to $100m, increasing proprietary trading revenues by 300%, pricing global trading activities in excess of $1 billion and maintaining a top 5% performers rating across the company. Mr. Stone was recruited as a professional footballer out of university by signing a 3-year contract with Southend United FC after playing For Team England u'16,u'17'u18 and playing for West Ham United for 10 years and he is a qualified FIFA 'B' soccer coach. He spent twelve years in the asset-backed securities market, holding front office roles in sales/trading, fund management, structuring, and fund raising. He is also the co-founder of HolovisionAR, a VR and AR company formed in Asia in 2015. Mr. Kim entered the blockchain industry in 2016 and has maintained an active role as both an investor and advisor and has focused on promoting the digitization of finance in blockchain through regulatory compliant means. Mr. Kim obtained his Bachelor degree in Business (finance) from Loyola University of Chicago in 1992; completed Level II of the CFA program prior to leaving the US; holds a USA Securities License FINRA (formerly NASD) Series-7 License; and holds Singapore Securities & Fund Management Licenses: CMFAS=> 1B; 3; 4B; SCI=> Module 5. Ms. Golubkova has held diverse financial roles in these companies including Vice President of Private Equity managing three successful exits; operating roles owned by Private Equity including due diligence, reporting and assisting in an NYSE IPO; and Investment Manager in a corporate advisory firm specializing in life sciences and high-growth technology companies. Ms. Golubkova holds a Masters of Arts, International Economics 5.0 GPA at Belarusian State University, International Relations Department, Minsk, Belarus; and an MBA at Robert H. Smith School of Business, University of Maryland, College Park, MD. Mihai is an experienced start-up executive in industries ranging from healthcare, to finance, to feature film. Projects have been regularly featured in press including The New York Times, Forbes, and NASDAQ. Mihai got his start in business doing due diligence for M&A, with a key research role in over $15B in deals for top 10 LBO firms. He has created multiple companies, applied for a patent in electrical engineering, assisted in creating new financial instruments, and today leads a capital formation focused consulting firm. MiHai holds a Bachelor of Arts, Social Sciences from Harvard University. DigiMax was formed by five partners, three which bring experience in the cryptocurrency and security token industry, and two which have more than forty years of combined experience raising capital through public companies and the issuing of common shares. This partnership brings together all of the benefits and expediency of raising capital though security tokens, with a team that has decades of experience raising capital in conventional securities markets. The result is a team that combines expertise from both the token, and the conventional public capital markets. This press release contains "forward-looking statements". Forward-looking statements can be identified by words such as: anticipate, intend, plan, goal, seek, believe, project, estimate, expect, strategy, future, likely, may, should, will and similar references to future periods. Examples of forward-looking statements include, among others, statements we make regarding changing the Company's name. Forward-looking statements are neither historical facts nor assurances of future performance. Instead, they are based only on our current beliefs, expectations and assumptions regarding the future of our business, future plans and strategies, projections, anticipated events and trends, the economy and other future conditions. Because forward-looking statements relate to the future, they are subject to inherent uncertainties, risks and changes in circumstances that are difficult to predict and many of which are outside of our control. Our actual results and financial condition may differ materially from those indicated in the forward-looking statements. Therefore, you should not rely on any of these forward-looking statements. Important factors that could cause our actual results and financial condition to differ materially from those indicated in the forward-looking statements include, among others, the following: shareholders approving the change of name to DigiMax, the adequacy of our cash flow and earnings, the availability of future financing and/or credit, and other conditions which may affect our ability to expand the App Platform described herein, the level of demand and financial performance of the cryptocurrency industry, developments and changes in laws and regulations, including increased regulation of the cryptocurrency industry through legislative action and revised rules and standards applied by the Canadian Securities Administrators, Ontario Securities Commission, and/or other similar regulatory bodies in other jurisdictions, disruptions to our technology network including computer systems, software and cloud data, or other disruptions of our operating systems, structures or equipment.